SNOW MIKU 2015 | “SNOW MIKU (Hatsune Miku)” festival livens up Hokkaido in winter! “SNOW MIKU 2015” is to be held! “SNOW MIKU (Hatsune Miku)” festival livens up Hokkaido in winter! The festival “SNOW MIKU 2015” that enlivens Hokkaido in winter has been confirmed to be held! “SNOW MIKU”, the character designed based on "a pure white snow sculpture of 'Hatsune Miku'", is the main character of the festival. 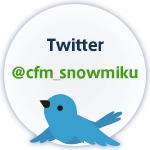 As Crypton Future Media, INC., the company which planned and developed “Hatsune Miku”, is located in Sapporo, Hokkaido, “SNOW MIKU” festival has been held in Hokkaido every winter since 2010. The main events of the festival are timed to coincide with the period of “Sapporo Snow Festival”. This winter, as the 6th anniversary, the festival will feature various events including the snow sculpture displayed in Odori Park, streetcars wrapped with illustrations, merchandising and stage shows inviting guests from various fields. You cannot miss the winter festival if you love “SNOW MIKU” and “Hatsune Miku”!